Dasht-e-Saminar is a mere 10km from the Greshk district center in Helmand, but despite being under government control, poppy fields abound. Here, poppy farmers go about their work freely and harvest the sap without any problems – sap that goes on to be converted into heroin. 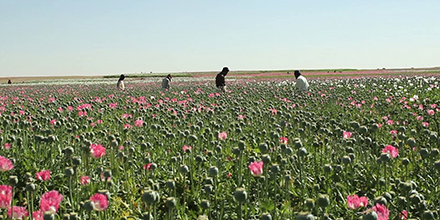 To mark International Day Against Drug Abuse and Illicit Trafficking on Monday, TOLOnews’ journalist Abdullah Hamim visited Dasht-e-Saminar to get a first-hand idea of what was happening in the region – especially as Afghanistan is ranked as the leading opium producer in the world. What Hamim found was vast poppy fields being cultivated freely in the government-controlled area of Dasht-e-Saminar. Some poppy fields were also conspicuously close to security check posts. Dasht-e-Saminar is located along Musa Qala-Nowzad road where the Taliban is known to be active and the insurgent group is accused of being deeply entrenched in the illegal drug trade business. Most farmers in this area say they have abandoned conventional farming in favor of illicit poppy farming – claiming this made a whole lot more money for them. “If I cultivate wheat on my land, I cannot pay expenses. Drugs are very expensive and it covers all my expenses,” said Akhtar Mohammad, a land owner in the region. “Government told us we are free to cultivate drugs,” said Mohammad Zaman, another local land owner. In Dasht-e-Saminar, not only do the adults work in the poppy fields, but so do teenagers and children who are known to be adept at harvesting the poppy sap. “I never attend school, I earn 10,500 to 11,500 Pakistani rupees (in harvesting season),” said Abdul Khaliq, a teenager. These fields are well cultivated and irrigated and are clearly run for their commercial value – albeit illegal. In addition to these farms, Hamim also found that tools used to harvest poppy sap were being sold openly at Greshk markets. Hamim also found that the average income for an adult harvesting poppy sap is 20,000 AFs for 15 days – although this can fluctuate according to the market value of the illicit drug at the time. Harvesting the sap is however labor intensive and it takes hours for a person to cover only a few poppy seed pods that are scratched in a specific way to extract the sap. So labor intensive is this, children are also roped in during harvesting season, and people from neighboring provinces flock to Dasht-e-Saminar to help. Residents say that during harvesting time they work day and night to milk the pods. Hamim meanwhile found that these farmers and harvesters have no regrets in terms of working the fields and are not concerned about the impact the final product, heroin, has on the global market. He also found that once harvested, the sap is mostly transferred from Baramcha district of Helmand province to Iran, Pakistan and on to other countries. 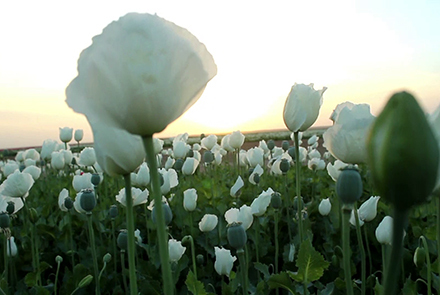 Counter narcotics efforts have been ongoing in Afghanistan for many years but little progress in combating the scourge has been made and the southern provinces, especially Helmand, are known to be safe havens for poppy farmers and drug smugglers - Dasht-e-Saminar being one such example. There are however concerns that next year’s poppy season could yield an even bigger harvest as reports indicate that farmers in the northern parts of the country are also starting to cultivate this illicit crop.